By March 2020, up to 213,124 inhabitants, 49% of them are females and 41% infants and young children, in Rafah is expected to benefit from this action. Specifically, the action will directly support 650 individuals (49% female and 51% males) including livestock farmers and their children, community committees, and stakeholders’ organizations. 100 farmers (50 men and 50 women) will be directly targeted in this action. The PWA’s recent water report reveals that there is a rapid and massive decline in the level of groundwater below the mean sea water level (MSL), causing seawater intrusion. The water measurements demonstrate that there is a large cone depression in Rafah governorate of about -19 m below MSL, considered as the maximum water level decline in the Gaza strip. According to the Palestinian Ministry of Agriculture (MoA), the total cultivated area in the Gaza Strip has increased from 189 thousand dunams in 2012 to 201 thousand dunams in 2014, with water consumption for crops at 92,7 MCM annually, while the remaining 2,6 MCM is used for livestock. This agricultural demand is outstripping the water supply, which will have long-term deleterious effects and requires immediate and urgent solutions. 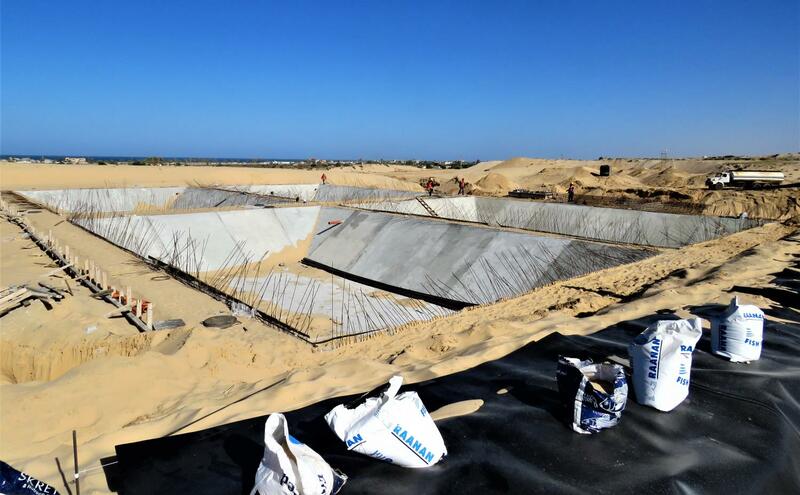 The assessment of wastewater treatment plants (WWTP) in the southern areas of the Gaza Strip (Khan Younis and Rafah) shows that upgrading of Rafah WWTP is required to reach the treatment requirements defined for reuse of wastewater. Currently, more than 10.000 m3 of partially treated wastewater is being generated by Rafah WWTP on a daily basis and is being discharged directly into the Mediterranean Sea, causing environmental degradation and pollution. Based on these issues, Oxfam with its local partners; Palestinian Environmental Friends (PEF) and The Palestinian Development Association (PARC), began implementing a 3 year action for the Re-use of treated wastewater for agricultural irrigation in Southern Gaza Strip in April 2017 funded by the European Commission (EC). The project’s overall objective is to contribute to more sustainable water and agricultural practices in the Gaza strip through reducing land-based sources of marine pollution. Its specific objective is to strengthen integrated water resource management in the Gaza strip through innovative environmental and agricultural solutions in southern Gaza (Rafah and Khan Younis Governorates). The post treatment plant that will be implemented by Oxfam and its local partners is a part of a national project, which includes two additional post treatment plants, which will be implemented by PECDAR after getting the needed fund form JICA and will pump the water to the western area. UNDP will be responsible to establish special solar system to provide the three post treatment plants with electricity in full coordination with the MoA, CMWU, PWA, PECDAR and Oxfam. Noting that the site of implementation was identified to implement the additional treatment plant through PECDAR based on availability of fund. Acceptance of using TWW for agriculture irrigation among farmers and consumers.